Find peace of mind in a warm, welcoming community. Discover where to recover between the hospital and your home. If you need post-hospital rehabilitation and nursing services for either yourself or a loved one, you’re looking for a provider you can trust. You’re looking for skilled, experienced professionals who will care for you or your loved one with the kind of commitment, respect and dignity that you would. You’re looking for people with integrity. It’s the difference you’ll find at New Albany Rehabilitation Center, Skilled Nursing & Assisted Living. Whether someone is coming for a short stay while recovering from a recent hospitalization or living in one of our assisted living apartments or our long term care center, it’s our aim to help maximize independence and quality of life with a plan of care that’s individualized to each patient. Learn more about our difference by exploring our services or scheduling a tour. 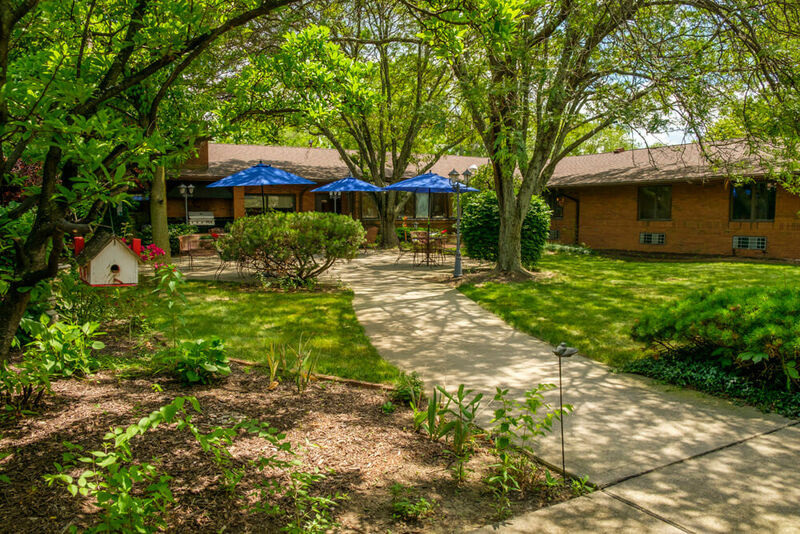 New Albany Gardens and Care Center is a trusted source for post-hospital rehabilitative care. Our inpatient rehabilitation program shortens the road to recovery, getting you home safe and sound after your stay in one of our 40 private deluxe rooms. Our rooms include built-in work space desks and plenty of storage space for your personal belongings. Our comprehensive rehab program includes physical, occupational and speech therapy. The therapy you receive will be based on a personalized plan of care, developed by our experienced therapy team with your input. They make it their personal mission to exceed your expectations. In addition to your rehab team, we also have a medical team to guide your recovery. We have a medical director and attending physicians to direct and coordinate medical services, a director of nursing to guide daily clinical operations, nurses and nursing assistants to deliver quality care, clinical programs and a wide array of services. If you’re looking for a place that feels like home but offers the security of care when you need it, New Albany Assisted Living offers 36 spacious private assisted living suites that are perfect for seniors. Our professional staff provides services for those needing minimal assistance with daily living activities like bathing, dressing, grooming and medication management. You’ll enjoy the privacy of your own suite, with the security of knowing help is there if needed. At New Albany, we focus on individual wellness and encourage continued independence with a tailored plan of assistance provided by professional team members available 24-hours a day. Each personal suite features separate living, sleeping and kitchenette areas, individually controlled heating and air conditioning, emergency call system, full private bath and walk-in closet. And we encourage you to personalize your suite with your own furnishings. For residents who need a greater level of assistance with daily living tasks, our community offers extended care services. At New Albany, residents in long-term care live in a comfortable, friendly environment and receive the help they need. You can rest assured knowing your loved one will be safe, secure and cared for by compassionate professionals trained to meet their needs. A variety of accommodations are available in our extended care community, including fully furnished private, semi-private and deluxe semi-private rooms as well as suites. All are equipped with half baths and free basic cable services. Selection and enjoyment. Those are the two goals our dining services team keeps in mind at New Albany every day as they plan meals for residents. We not only want to nourish you but honor your ability to control and make decisions about what and how much you eat. That’s why in addition to a seasonal menu we offer our popular Bistro Menu Program to provide fresh, healthy, made-to-order alternatives. And to add to the variety, our culinary staff prepares numerous side dishes, ethnic favorites and homemade soups and desserts. Special diets: Our dietitians play an important role in shaping our menus and we are able to handle most any special diet to include therapeutic diets. Creating opportunities to relax, rejuvenate and recharge are important aspects of the New Albany Gardens and Care Center experience. As our guest, you can take advantage of many center amenities and services. Here you’ll have beautifully landscaped courtyards, patios, a private dining room and comfortable lounges to enjoy and share with family and fellow residents. We also offer purposeful and individualized activities designed to maximize your quality of life. New Albany has several quality measures in place to make sure we’re living up to the expectations of our rehab guests, residents and their families. Customer satisfaction surveys are given to each skilled nursing and rehab guest to complete prior to discharge, and New Albany consistently receives excellent ratings from the Centers for Medicare & Medicaid Services and the Ohio Department of Health. A patient care conference is a scheduled meeting between a patient, their loved ones and their care team to discuss their treatment. Here’s are some good questions to ask. Ever wondered what assisted living dining services are like? Our expert gives you the inside scoop on how the food really is. How can we help your parent stay active and engaged in a long-term care community? Through person-centered activities based on their interests and activity levels. Since February 1998, we’ve lovingly served the residents of New Albany and the northeast Columbus and central Ohio area, including Westerville, Gahanna, Pataskala, Johnstown and Reynoldsburg. We offer a personalized approach to rehab and senior living, as well as a friendly and knowledgeable staff, beautiful grounds and well-appointed rooms. We are part of The MacIntosh Company, which is locally owned and operated. To learn more about what sets us apart, discover the MacIntosh Difference.